The Gabriel Alegría Afro-Peruvian Sextet is an important band, and it should not come as a surprise that no smallish house in which they perform will be unpacked. It has doubtless happened before, but Saturday’s concert – of two separately vended sets – was the first time I have seen a full house at the Somethin’ Jazz Club, the oddball music and sushi establishment that holds forth on E. 52nd Street. The Tutuma Social Club, once housed in its own space but now an itinerant entity, took full advantage of Somethin’ by turning the evening into a total experience of Peruvian culture and cuisine. As the band served up material from each of their several albums (in anticipation of a Canadian tour), Tutuma delivered pre-ordered Peruvian sushi to our tables (not so strange as it sounds given the ethnic mix that is modern Perú), all of which went down well with the house saki. 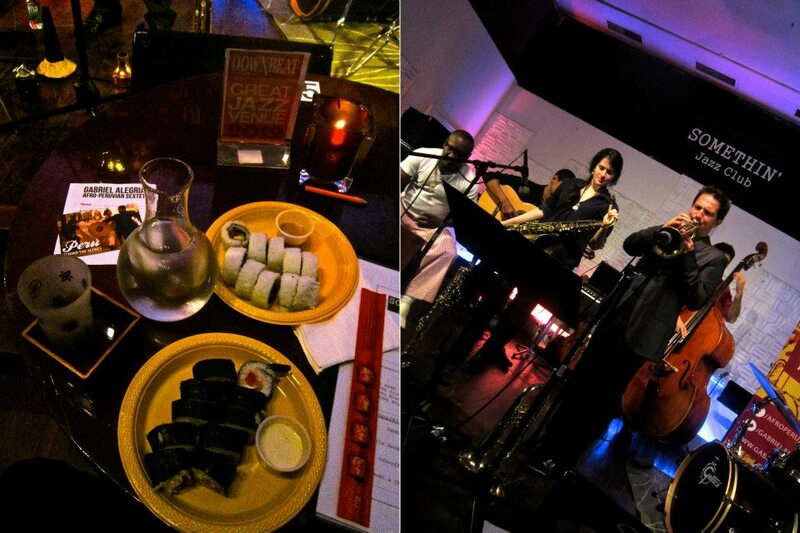 The sushi rolls were dense and flavorful, and the air was full of the Sextet’s music, which took us from their first album, NUEVO MUNDO, through their second, PUCUSANA, and into the realm of extreme musical accomplishment that is CITY OF KINGS, their most recent. If one stepped back for a moment from the deep involvement that these musicians incite when they perform live, the realization struck that the development of a crucial contribution to a whole genre of art, with all of its interconnections and cultural cross-currents, was being recapped in our presence, even as it renewed itself for the future. The show was nearly as bracing as the CITY OF KINGS release party at the Zinc Bar was a few weeks back. And it had the added advantage of Yuri Juárez’s guitar on “A Lima llegó el tondero,” which makes it clear how great a composition that song truly is. On stage were most of the Sextet’s regulars: Juárez, Laura Andrea Leguia (the saxophonist and composer on whose energy the band seems to feed), Freddy Huevito Lobatón Beltrán (adding spoons to his repertory of percussion instruments), Shirazette Tinnin (drummer extraordinaire), and of course Gabriel Alegría (indispensable trumpeter and composer). Pablo Menares, a frequent sub on bass, was there, and so was Dillon Treacy, who drummed ably for the first set and part of the second. In this fusion of food, drink, and music, the latter of course was king, but how remarkable a balance was there to be had, of sound, flavor, and sheer giddy pleasure.